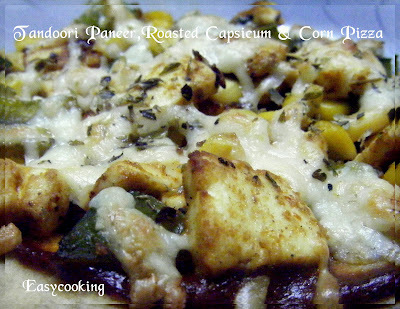 Easycooking: Tandoori Paneer,Roasted Capsicum&Corn Pizza!! "What to make for dinner?? "A question which pops up before me every day.Ever since I started having rotis for lunch,I detest making them again for dinner.Rice is a no-no and so is rice-based items and sadly I end up making rotis itself.Its been a while since we ordered food from outside or dined out,thanks to the Swine flu,but to be frank,we did not miss it much[dining out that is,NOT Swine flu:)]. We have not been great fans of Pizza.Once in a while we do have the urge and we order from Dominos,be the perfect couch potatoes and curl up in front of the tv.Thats it.Off late I have been saying No to Ajay’s offer for a pizza takeaway ever since I saw an ad for a pizza that is loaded heavily with cheese-not the normal one[that is tempting],the one which only has cheese..umm,I am not sure I want that! 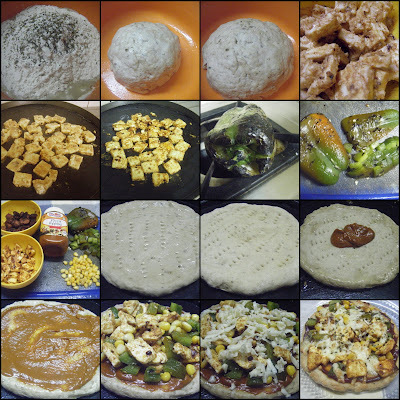 !I have made Pizza once long back and loved it but have not recreated the magic again. Then comes the dessert queen with her Pizza,not one but two of them back to back.I had bookmarked the first one and planned to make it this weekend.But no,she tempted me too much with this one.While I was going through the post,I was thinking of a veggie alternative to the Tandoori chicken sausage and Paneer was chosen unanimously..by me:). We ♥ed it..;).I made it almost low-fat..quite an oxymoron,can pizza ever be low-fat?? 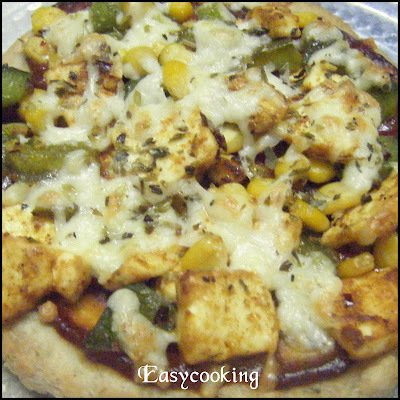 ?Chose a whole wheat base and pressed the break button while grating the cheese.The topping was spectacular,paneer was soft,roasted capsicum tasted smoking hot and the sweet corn gelled perfectly with the rest of the ingredients. Marinate paneer cubes with tandoori masala, red chilli flakes,salt and curd for 30 mins. Heat oil in a pan and saute the paneer till done. Hold the pepper using a fork and roast it over the flame till the skin gets blackened. Rub the black skin off and discard the seeds. Cut them into bite sized portions. Roll out the pizza base as directed here. Spread 1½ tbsp of Pizza sauce over it. Sprinkle roasted bell pepper, 3-4 tbsp of sweet corn kernels and sautéed Paneer. Spread another 1 tbsp of sauce over it. Grate the cheese over it as even as you can. I sprinkled some oregano on top of the cheese. Bake them in a pre-heated oven ( at the max.temp) for 10-12 mins. I didn't couldn't take more pics as I was hungrythere was no proper lighting in the kitchen and I was yearning for a bite it was getting late:):):). ♥ed each and every bite of it.Thanks Ria,you are a ♥darling♥!! That's a lot of pain taken for making that Pizza dear. I personally like the homemade pizza and urs look absolotutely yum.Pizza hut also offers paneer tikka pizza, but yours looks better. Divya! There it is! I was waiting for this post ever since you mailed me about it! It looks DELISH! Thanks a bunch for trying it out! Now you got me curious... I HAVE to try this out.Those pictures are great. Lots of hardwork gone into that..totally yummy divs..
wow Divya what a combination of topping..looks delicious..
never new pizza base can be made with whole wheat flour..nice topping too...bookmarking it.. This brings fond memories to me. Sharan's cousin has created an earthen oven on his terrace in Blr and we (used to) have pizza parties frequently over there. We would make everything from scratch too. In addition we tried bruscettas, bread, barbequeing too. It was good fun and for a change too many cooks didn't spoil the broth..
Thats just tooooo much!..loved the entire plate! I'm up for pizza of any kind and any time, this has some of my fav toppings, nice! U r surely taking ur blog a level higher..loved the base..perfeeectt..sometimes my visualization shows: pizza base+ paneer dish (any wt a thicker consistency) topped wt a bit of moz..n our own inhouse pizza..but just awesome!KEEP IT UP!! I am new to ur blog.But i am so happy to have come across ur blog..